If the women’s march was loud and the airport protest of the Muslim Ban were fierce, Gentle Riot is exactly what it sounds like. It’s a small simple way of raising your flag through your everyday life. You don’t need to wait until the next protest to show your force and you don’t need to wait for Kendall Jenner to hand you a Pepsi. This badass brand created by Estefany Arias gives you a way to use your voice every day. You are a gentle rioter and she provides you with the gentle riot gear. Soft spoken and sweet, Estefany is the last person you might expect to have a brand with the word “riot” in it, but then you understand what makes it “gentle,” yet powerful. “I feel like Gentle Riot is a consistent practice in how to live and walk through fear,” says Estefany. 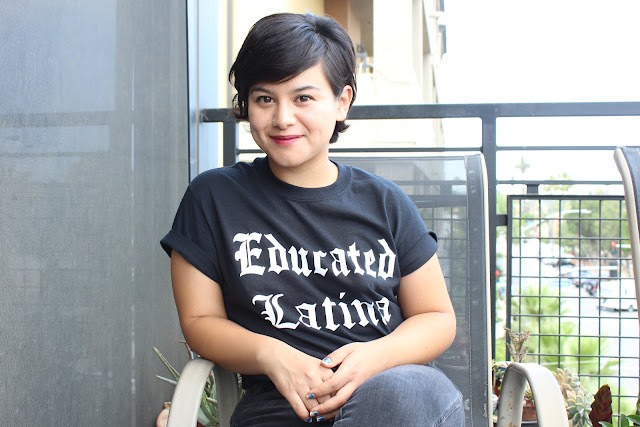 Shirts with sayings like, “sin miedo,” “chillona,” and “cosita seria,” are for every girl who needs to walk out of the house with a reminder of how to live and walk through fear herself. Which is what exactly what Estefany is trying to do. From early on, Estefany knew she wanted to work in fashion. At her public school in Las Vegas, she was fortunate to have access to a database that provided the students with list of different types of jobs. Knowing she wanted to be in fashion, this made the work a little easier for Estefany. She leafed through the database and saw all the different types of jobs she could do. She saw herself in a career in fashion. It wasn’t easy to convince her Guatemalan born mother and Nicaraguan born father that the work she wanted to do was real. They didn’t understand the fashion world and the many roles someone in that industry could take. “At first they were like….. “Is that real? Is that a real job?” Estefany Explains. “I told them, ‘Yea!’ There’s jobs in production, technical designing.” So Estefany went off to college with dreams of a fashion career. When she got to Cal State Long Beach, she decided to major in fashion and minor in women’s gender studies. Looking at her brand now, the two make complete sense in their marriage through her work, but at the time they created tough contradictions in Estefany’s mind. “I love fashion but once I started taking my women’s studies classes it started messing everything up.” Esteafany describes how her love of fashion came in question the more she learned about it on a global scale. Estefany began to learn how to marry her feminism with fashion and design. Now Estefany works through a different type of balancing act that keeps her grounded and content. During the day, she's a production coordinator for Stylestalker and The Jetset Diaries, a contemporary women's wear brand. She works with manufacturing, fabric, dying and other problem solving areas of running a fashion brand. During her free time, Estefany dedicates herself to Gentle Riot. From that moment, Estafany’s side hustle and new found love was born through her brand. But it’s clear that there’s even more to that. It’s not just about women who do their own thing. The image around the room shows women who do their own thing-sure, but they also do a hell of a job lifting each other up. In this room alone, Estefany has brought together 4 different business with at least 15 different women all together, just for a small shoot for her brand. The girl power in the room is inspiring. Estefany wants to center the female experience in her brand, but she also wants to challenge the standards set by the fashion industry she loves so much. “It’s important to decolonize in that way and say “what else is beautiful?” she explains. She’s very conscious of the people she put in her photos and how she represents her brand. Estefany has taken bold measures to put her Latinidad at the forefront of her brand. Her items are relatable, fun, and heartwarming. 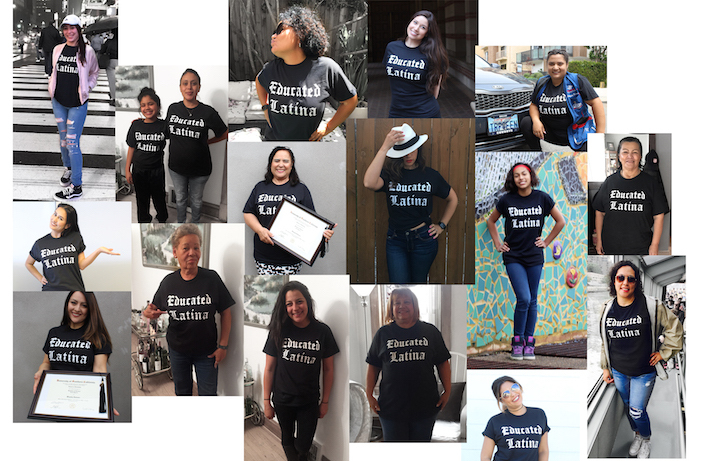 Seizing the day with “Sin Medio” written across your heart can make any Latina feel more empowered than ever before. And even more lucky for the customer, the items from Estefany’s line are all blessed by her grandmother. Estefany explains that “No Lost Boys” was inspired by a less than stellar dating scene. “I feel like I have a set path and things I’m passionate for. I’m running towards them and I’m working towards them and I’m not afraid to work towards them. I don’t want to have a partner that’s lost.” Date after date Estefany found herself interacting with men who didn’t seem to be on a set path like she is. Rather than lowering her standards, Estefany made a proclamation and a tee shirt. “There’s nothing wrong with being lost,” she explains, but in a partner that’s something else. Yes, we absolutely need activist on the front. We need them at the women's march and at Black Lives Matter Protest and in Charlottesville this past weekend. But we also need them on the day to day at home in our big towns and small cities. We need them making statements everyday with their heart, with their minds, and through Estefany Arias, with their clothes. Follow Gentle Riot on Instagram @GentleRiot and shop their tees here. I love these articles shining the spotlight on badass women. Girl power! Totally awesome that she has her grandmother bless her line. Adorable!